A big question that anyone using alternative energy will ask is what are the best batteries for starting an off-grid energy system? In this article you will learn the top 3 batteries to accomplish this. 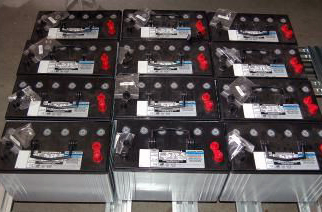 One of the biggest capital outlays associated with alternative energy systems is the batteries in the battery bank. So choosing the right batteries for your off-grid system is vital (and keeping the batteries alive as long as possible is also vitally important)! 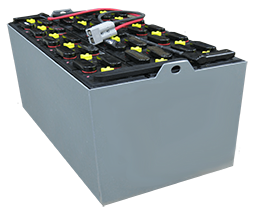 Before learning what 3 batteries we recommend for your alternative energy system’s battery bank it’s very important to understand that you don’t have to purchase the 3 batteries we recommend brand new. Doing this will will save you a lot of money when building a battery bank and it helps make alternative energy accessible to those with a smaller budget! So, what are the best batteries to use in your solar power, wind power, or other alternative energy system? 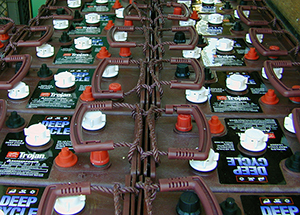 Many of the batteries that are used in renewable energy systems were first made for other purposes. 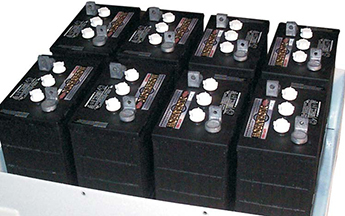 The best example of this is the lead acid battery which has led the industry for a long time. It’s important to know, that as of late, lithium ion batteries for residential alternative energy systems, like Tesla’s Powerwall, have been getting a lot of exposure – however the initial investment into lithium ion batteries is quiet a bit more than the initial investment into lead-acid batteries. The Powerball may at some point change this but at the moment deep cycle lead-acid batteries are the most affordable, and practical solution for a home battery bank. One of the reasons that some people favor SLA’s is because they require little maintenance. Unlike FLA’s that need to be checked regularly for water level, SLA’s that are used properly can be left alone. There are some exciting new developments in the battery world for alternative energy. These new products should be entering the market over the next couple years, like the lithium ion Tesla Powerball. But at this time, our three favorite batteries for residential off-grid, alternative energy systems are golf cart batteries, L16 batteries, and industrial batteries. Click Here Now if you’d like to learn exactly how to recondition old batteries and even profit from this knowledge. I’m going to learn all I can about this. We are full time RV’rs and we have wanted to take the next step and go solar. Thanks for the great info! A thought ! buy enough battries to make your system work. When the SHTF we will have so many cars and trucks sitting around that with just a wagon one could collect many to build a sizable storage. take the extra ones that have the fluid and drain them into glass bottles. leaving no air and seal. it should last a good while so it is used to repair other batteries. we have golf clubs all around that would be a good source for the batteries and the chargers. Because the food is gone other things would still be in the hardware department as well as auto. parts to repair cars would be worth gold. Just a thought. 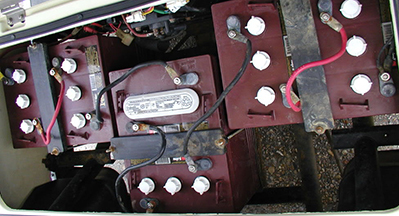 Problem with the “we can go anywhere and collect lots and lots of batteries and gasoline from abandoned cars, rv’s ect. is that no one thinks of an EMP strike, 15 seconds that will drive us back to the 1850’s, crap hits the fan type of scenario. You may be able to use the gasoline for fire starter, but it will do you no good to collect it to say run a generator, batteries will be fried as well as any electrical components of automobiles, solar, wind generators, electric motors for pumping water, trucks that deliver food to Wally world, sewage plants ect. As well as roaming bands of looters, robbers, and just generally mean people who are trying to find food and water and someone to hurt. Very true, however you could always store some batteries in a Faraday cage. Do a search on our site for Faraday cage for more info on this. I am French, I like your subject on battery, it is very interesting to red it, but can you give me 2 more informations; is it possible for battery 12V and 24 V?. Thank you for your answer, and sorry with my English.